Like a number of other bloggers I am preparing to start the Coursera MOOC, Plagues, Witches and War: The Worlds of Historical Fiction and one of the papers suggested as prior reading before the lectures begin has set me wondering what exactly fits into the category of historical fiction. Perry Anderson’s essay, From Progress to Catastrophe, first published in the London Review of Books, takes a broad look at the genre from the earliest days of its inception through to the present day and while all the usual suspects are discussed in respect of the period up to the 1950s and 60s some of the more recent novels he mentions took me by surprise. The Second World War, when it came, reinforced the effects of the first. The flow of historical fiction at the lowest levels of the genre… swelled again as the mass literary markets expanded with the post-war boom: in Britain hoary sagas of doughty patriots battling against Napoleon poured – and still pour – off the presses… over time, this output has yielded a teeming universe that can be glimpsed in such omnibus guides as What Historical Novel Do I Read Next?, with it’s capsule descriptions of more than 6000 titles, and league tables of the most popular historical periods, favoured geographical settings and, last but not least, ‘top historical characters’ – Henry VIII and Jesus Christ tie for fourth place. I know that some people will take exception to the phrase lowest levels of the genre but what I was reading was and as I began to study literature more thoroughly and became more judicious in my selection of reading matter I left historical fiction behind me not realising that even then there was more to the genre than I was giving it credit for. As Anderson points out this was also the period in which Lampedusa’a The Leopard appeared and the first of Naguib Mahfouz’s Cairene Trilogy, Palace Walk, was published. However, I read neither of these books because I had walked away from the historical novel, I was now looking for more literary material. Except, as the latter part of this essay makes clear, I hadn’t left the genre behind. What I somehow failed to recognise was that many of the literary novels I was reading (and let’s not get into a discussion as to how you define the term literary in that context) were also historical fiction. I’m afraid my early acquaintance with those hoary sagas, not to mention an occasional session with the odd bodice-ripper, had blinded me to the fact that it is perfectly possible to write a literary novel and set it in a period that pre-dates our own. So, when Anderson starts to talk about such favourites as Pat Barker’s Regeneration Trilogy and A S Byatt’s Possession, I find myself being brought up short. These are not historical fiction, they are literary novels. But of course they are historical novels as well, it is just that in my blindness I haven’t been able to see that. As Bones might have said: “it’s historical fiction, Alex, but not as you know it”. I have been equating historical fiction with some of the poorly researched and even more poorly written novels that I read in my teens – how much more stupid can I get? Especially as I know just how much research goes into some of those current historically based books. I was listening to Simon Mawer, author of The Girl Who Fell From The Sky only last week saying that a novelist who works in an historical period must always know that period so well that they are aware every time they deviate from the facts and be able to defend their decision. And for goodness sake, the writer I probably admire more than any other is Hilary Mantel! I suspect that what has been happening here is that I have been more concerned with what has been occurring in the plots of these books and with the universalities of the themes that the writers have been exploring than I have with the setting. That they are placed in the dim and distant past (or in some cases not so dim or distant) has passed me by as I have focused on what the author has had to say about the eternal truths of human nature, forgetting that the very fact that those truths are eternal means that they cross centuries as well as geographical and social borders. If nothing else, this course is going to make me re-evaluate my approach to the genre and reconsider some of those books that I have read without really taking account of their historical context in the past. Oh, and by the way, if anyone happens to know who came first, second and third in that list of ‘top historical characters’, i have to admit that I would dearly love to know. Interesting post, Alex. My preference is for the more literary type of historical fiction too and I’ve found it a pleasure in the last few years to have discovered authors like Dorothy Dunnett, Hilary Mantel, Sharon Penman and Patrick O’Brian. I don’t mind reading the occasional historical novel of the less ‘literary’ type as well, as they can still be entertaining and enjoyable, but I can see how reading them almost exclusively could give a bad impression of the whole genre. I think the historical fiction genre encompasses a much wider variety of books than people tend to realise and hopefully there should be something for every taste! I don’t get on with O’Brian but Penman is a name that keeps coming up so I really must give her books a try. I think too much of anything can sate the reading palate and force you elsewhere. I suspect that would be true of even the best of writers if you read nothing else. I suppose ‘historical’ fiction is a generational term – I certainly consider WWII set novels as historical these days, but the 1950s are too close to my own birthdate to feel truly of another generation. I don’t read a lot of pre 20th C books though, although I do plan to return to the Lymond Chronicles soon to pick up where I left off. I don’t know the Lymond Chronicles, should I? Actually, I think your point about the relationship between the reader and the ‘historical’ setting is very interesting when it comes to novels set in more recent periods. I know that I read Laura Wilson’s crime novels set in the fifties more as social commentary on a period I remember than as historical in any way, but I doubt my teenage godchildren would do the same. Lymond = Dorothy Dunnett’s first saga set in Scottish Borders 16th C. Chock full of history and literary reference.. I read and enjoyed the first, but got stuck on the second vol of 6. You’d probably enjoy them! I really should take at look at Coursera MOOC. While I have little interest in historical fiction, you’ve made the course sound fascinating already. Yes, do. There are too few literature courses available but this is the most innovative I’ve come across, with a number of authors involved. It’s absolutely free, so you’ve nothing to lose even if you only audit it. I will bet Mary, Queen of Scots is in the top three. My bet would have been Elizabeth I, Tom. Probably they’re both in there together. Can’t answer your question re the three top historical characters, but the cover of the book on Amazon shows War and Peace, The Far Pavilions and Ivanhoe – and of course Scott is credited with writing the first historical fiction in the English language with Waverley. It’s one of the reasons I’ve avoided tagging until very recently and I still don’t think I’ve really understood the potential. My temptation is simply to tag by author, but that doesn’t help those who haven’t read that particular writer before. My theme needs categories and tagging to make the menu work so I’m a bit obsessive about it now. Sometimes it’s really hard to fit a book in anywhere, and other books seems to fall into just about every category. And it has really surprised me how many books have a historical fiction aspect once I started trying to categorise them. This really made me think. I’d tended to see “historical fiction” in my head in pretty much the way you described in your post – I’d have defined it as anything before 20th Century. So for example I’d never have thought of Pat Barker’s Regeneration books, which I love, as historical fiction – but now I reconsider I see exactly what you mean. The course sounds like it will be an interesting and thought provoking one. I hope you enjoy it. Thank you, Col. My immediate problem is with the book I’m reading for this week’s book group,The Song of Apollo, do I tag that as historical on the grounds that Troy was almost certainly fought over and the Greeks of 8th Century BC would certainly have seen it as reflecting historical fact. Or do I tag it as myth. Where does the line between history and myth come anyway? And I meant ‘Song of Achilles’. For some reason I keep calling it by the wrong name. This may be because Apollo was on the side of the Trojans and I am a Trojan to the core. Well I hope you enjoy Song Of Achilles. I thought it was fantastic. Alas I’m firmly on the side of the Greeks! I guess we are destined to be the Man Utd or Liverpool rivalry of Greek Myths! Did my doctorate at Liverpool so the dye was cast early on. I have been rolling this over in the little gray cells and you can look for my comments in a separate post. Thanks for the heads up about the course, Mike. Coursera is great. I think what is shocking me most is that because of my early experiences with some very trashy historical fiction that paid little more than lip service to research I have been dismissing the whole genre. Reading those first few essays has really made me appreciate just what very fine literature there is in the historical mode. How can impossibly find the time to catch up with everything I’ve been missing? I signed up for the Coursera and also read the article. It’s an excellent piece and I very much appreciated Lukács’s thinking along with Anderson’s thoughts on the later development of the genre. 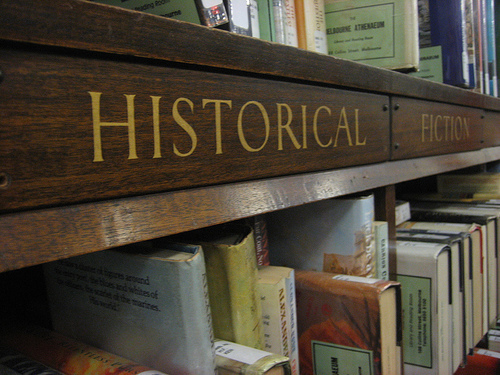 It would seem there may be many parallels between historical fiction and historiography itself. Have you also read the Philpott article? He also references Lukàcs and takes up the question of a link between the two as well. Is there a link for the Philpott article? Yes, it’s on the Burning Books blog that we were sent last week. I think it’s in either unit 1.2 or 1.3. It’s called ‘A Novel Approaches Prelude: A Brief History of Historical Fiction.’ By the way, I spelt his name incorrectly; are two ‘l’s. I found it and read it – thank you! Great stuff. Where the Anderson article seemed to address the “fiction” side, the Phillpott article addresses the “historical” side – and so we have a balance. Today books often seem to fall into more than one genre so a book can be literary fiction as well as historical fiction because of the era in which it is set, but that is merely a reading point of view that I have recently come to, as I would have thought of them in the past more as a kind of historical saga, particularly those that seem to be published prolifically. Unfortunately the earliest historical fiction I read was all either great long many-volumed sagas or poorly written historical romance which has substantially coloured my view of the genre. I am having to do some pretty rapid re-evaluation. Those genres are pesky things aren’t they, just when you think you know exactly what box into which a certain novel will go, along comes a piece of info that turns that idea on its head. It’s the melding of genres and the fact the boundaries are fluid that seems to produce the most interesting work though. No, I know what you mean about ‘Possession’. There’s a whole swath of novels that are set both in the past and the present. I ran a Summer School about it two years ago. Some of them seem to place the emphasis on the historic side whereas others are really more interested in the present. I suspect you have to take a decision as to whether they are historical fiction or not on an individual basis. I did sign up for that class but was not into it… I regret it now… The only class I have taken in Coursera was a Holocaust class offered last year which I enjoyed and completed all the assignments. It was better than many of the others I’ve looked at. But I find that these online courses all underestimate the amount of time that you have to give to them.